Yesterday there were a sleuth of updates/patches issued from Apple and Microsoft. The Mac OSX patch covered 58 security vulnerabilities. 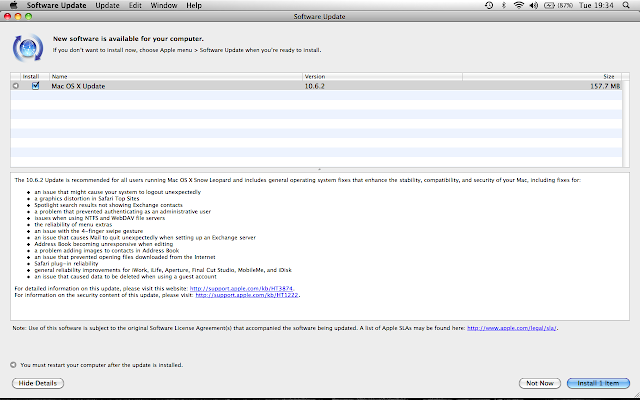 A screenshot of what the Mac OSX update actually displayed on screen. There is more to it than what Apple wants us to see and believe. The other day I read an article on the internet saying that the Mac OSX Snow Leopard (costing £25) was a great value for money upgrade compared to Windows 7 (costing upward of £78). I felt that was hilarious. When I upgraded to Snow Leopard, I hardly noticed any difference. I had to double check "About this Mac" to confirm that Snow Leopard was indeed installed. The changes were more beneath the surface. I certainly felt that it was a wasted upgrade. Comparing that to Windows 7, it is a major upgrade for the Windows XP users and maybe not so much for the Vista users. Before upgrading to Windows 7, my PC was very sluggish. It used to take ages to boot up and applications in general were very slow to loadup. Things have certainly changed with Windows 7. All my computers seem very slick and fast, including my aging Dell Inspiron 8200 notebook. Hi, I found your blog while looking to triple boot on my new MacBook Pro. I find that Windows gets slower over time, generally due to the registry filling up. So I can imagine that installing Windows 7 would speed things up, but not necessarily due to the operating system itself. I wonder what the speeds for boot up compare between all the Microsoft OS. It would be neat to see Win2k, WinXP, Vista and Win7 all installed on identical machines and then time their start up. Cheers, and I enjoyed the blog!